With an REI coupon code you can enjoy incredible deals on camping gear, hiking boots, climbing equipment, and other outdoor sporting goods. Shop the REI Outlet for amazing savings and watch for clearance sales and other special discounts. 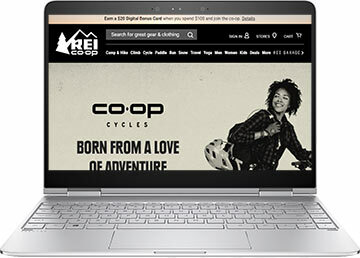 This page lists available REI.com coupons and other discount listings of the best deals on outdoor sports gear. The gadget-loving outdoorsman will find much to delight in at www.rei.com. REI is unique in that it’s organized as a consumers’ cooperative, a form of free enterprise that’s oriented more towards service than profit. There’s a nominal fee for a life-time membership in the co-op, and members receive special benefits such as dividend checks based on their purchases and the ability to buy returned and damaged goods at significant discounts. REI opened its doors in Seattle in 1938, but it’s expanded to boast over 100 retail stores in over 25 states. At REI.com, you’ll find great gear shops for camping and hiking, climbing, cycling, fitness, outdoor lifestyles, paddling, and travel. Stop by the snow shop for snow sports equipment, whether you’re into snowboarding, snowshoeing, downhill skiing, backcountry skiing, or cross-country skiing. Save on coats, sweatshirts, boots, shoes, athletic clothing, outdoor wear, and other apparel for men, women, and kids. They sell all manner of cruiser bikes, folding bikes, kids’ bikes, mountain bikes, hybrid bikes, road bikes, urban bikes, and – techies will love this – electric-assist bikes. In addition to their own brand of products, they carry Burton, CamelBak, Chaco, Columbia, Bob Strollers, Key 2, Mountain Hardware, Life is Good, Oakley, Osprey, Patagonia, Yakima, Vibram, Thule, Nalgene, and Novara. Top gear categories include backpacking, sleeping bags, stroller and bike trailers, sunglasses, tents, and watches. Into kayaking and canoeing? Visit the paddling section for paddling gear and clothing from renowned brands: Camaro, Advanced Elements, Harmony, Extransport, and Seattle Sports. Rock climbers will discover a wide assortment of rock climbing equipment from Black Diamond, BlueWater, Omega Pacific, Edelweiss, and Mammut. REI.com stocks a wide selection of GPS devices from Garmin, Timex, Polar, DeLemore, and Magellan. Get a handheld GPS or a GPS in a watch. REI’s high-tech watches will blow you away: they can monitor your heart rate, give you directions, help you train, and monitor your fitness level. GPS and watches aren’t the only cool electronics this outdoor sporting goods store stocks. They sell digital helmet wide-angle cameras, wearable camcorders, action cameras, personal locators, pocket weather meters, two-way radios, and more. Frugal customers can also shop the REI outlet for reduced-price merchandise.